International research team that includes Argentine scientist has solved the mystery behind the leaves size of various plant species. The article was published in Science. Sandra Díaz. Photo: courtesy IPBES. Why is a banana leaf so much larger than the yareta’s? Why are leaves in the rainforest likely to be larger than in deserts? According to textbooks, the reason is the balance between the availability of water and overheating. However, this phenomenon is more complex. 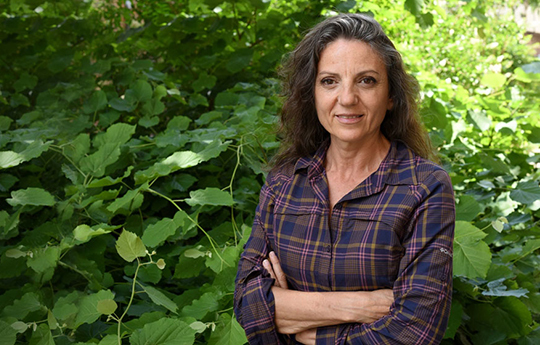 Sandra Díaz, senior researcher at the Instituto Multidisciplinario de Biología Vegetal (IMBIV, CONICET-UNC) and professor at the Universidad Nacional de Córdoba participated in a research team that comprises scientists from eight countries and is led by the Australian ecologist Ian Wright. The study proved that in a great part of the planet the factor that limits the maximum size of the leaves is the night temperature and the risk of damage caused by frost on the green tissues. The study combined the analysis of more than 7600 plant species conducted with a new theoretical development called “energetic balance of leaves” to predict the maximum feasible size of the leaves in all the planet. It was based on two risks: daytime warming and damage caused for the frost at night. The leaves enlarge as the risks increase. These results can be used to build more accurate vegetation models to improve the predictions of their response to climate change. “The leaf size is one of the main features that define the specter of the shape and function of the plants”, Sandra Díaz commented. That information was part of one article published in Nature that presented the results of one study in which Wright and other colleagues -who also worked on this recent article- participated and she conducted. “Last year we showed the importance of that feature in the general design of vascular plants; and this new study explores the selective forces behind that variation in nature”, the scientist at CONICET concludes. Ian J. Wright. Macquarie University, Australia. Ning Dong. Macquarie University, Australia y University of Reading, UK. Vincent Maire. Macquarie University, Australia and Université du Québec à Trois-Rivières, Canada. Colin Prentice. Macquarie University, Australia e Imperial College London, UK. Mark Westoby. Macquarie University, Australia. Sandra Díaz. Principal researcher. IMBIV and Universidad Nacional de Córdoba. Rachael V. Gallagher. Macquarie University, Australia. Bonnie F. Jacobs. Southern Methodist University. USA. Robert Kooyman. Macquarie University, Australia. Elizabeth A. Law. Macquarie University y University of Queensland, Australia. Michelle R. Leishman. Macquarie University, Australia. Ülo Niinemets. Estonian University of Life Sciences, Estonia. Peter B. Reich. University of Minnesota, USA and Western Sydney University, Australia. Lawren Sack. University of California, USA. Rafael Villar. Universidad de Córdoba, Spain. Han Wang. Macquarie University, Australia and Northwest A & F University, China. Peter Wilf. Pennsylvania State University, USA.